World 2 is the third set of boards in the Toad Scramble mode of Mario Party: Star Rush. 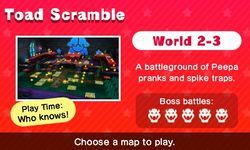 They are unlocked by completing a game on World 1. 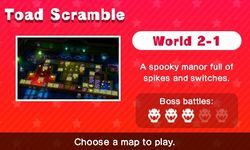 World 2 features a ghost house theme. All maps in this world feature switches that alternate spike gates when landed on. Some boards also feature a gimmick where ally characters are always spawned as twins. One of these allies is actually a Peepa, and when recruited they take up a slot in the party for a few turns. They contribute a 0 to -1 dice block to every roll while part of the party.